Things like “Shocking hidden message on Coca-Cola logo, and other Facebook scams” and “Girl captured DEAD on Google Street View Captured by Google” trick people into adding rogue applications to their accounts. These can then be usedto spread more of their scams. There’s an account which suddenly started advertising a scam page, even though the user hadn’t logged in for days. In other words, they hadn’t been socially engineered or clickjacked into posting this message. Other versions of similar scams are “SHOCKING SATANIC Message In The Coca Cola Logo” If you see any of your Facebook friends posting these messages, and you click on the link you’ll be walking into a trap yourself and could soon be spreading the dodgy links to your online friends as well. And it’s not just hidden messages in Coca-Cola logos. 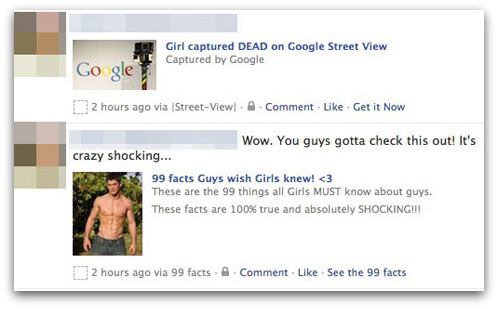 The same Facebook users are being used to spreading messages about: Girl captured DEAD on Google Street View Captured by Google and 99 facts Guys wish Girls knew! <3 These are the 99 things all Girls MUST know about guys. These facts are 100% true and absolutely SHOCKING!!! Until more users learn to be suspicious of liking pages like this, and keep a closer eye on what installs itself on their Facebook page, these scams are likely to continue. If you’ve been hit by such an attack – check that your profile no longer “like”s any of these pages, and remove the right of suspicious applications to access your account. It also may be time to choose another password – make sure it’s a strong one. A hoax alert about a virus is rapidly spreading across Facebook according to security company Sophos. Sophos said a large number of people, hoping to help other users of the social-networking site, are forwarding the warning that an alert about a girl who killed herself over something her father wrote on her wall is infected with malware.Sophos said although there is no malware involved, it is alarming people. The situation is complicated further by cybercriminals creating Facebook pages that pretend to host pictures of the non-existent ‘girl’. These pages are more dangerous and designed to generate money by sending unsuspecting users to online surveys. Cluley has provided more information about the hoax on his blog. The hoax started with rumours on the internet in 2008 that a girl had killed herself. Cluley includes images of the message and pages linked to the hoax. The blog also gives some interesting background to the rumours of a girl’s online suicide.